Pentax MX and Spotmatic SPII, with some cool lenses! I'm consolidating my SLR collection and have decided to sell off my Pentax gear, which I've not been using. All of the gear listed below is fully functional. (1) Pentax MX (black) with a Voigtlander Ultron 40mm f2.0 SLII (black), sold bundled. The MX is in fair to good user condition (roughly KEH bargain grade) with some wear on the back. It is a manual camera. The meter works properly and shutter speeds sound accurate, although I have not had the shutter tested. The film I ran through the camera was properly exposed based on meter readings. The Ultron is the rare and now discontinued Pentax K mount version, with aspherical elements. It is in like-new condition. The glass is clear, no scratches that I can see, no dust spots or fungus. This is an incredibly sharp lens. It comes with a 52mm UV filter, and the hood with 39mm front lens cap. Price for the set is $375.00 US (I will not sell the lens and camera separately). (2) Pentax Spotmatic SPII (black) with a half case and an Asahi Super Takumar 50mm f1.4 lens, sold bundled. The camera is in good user condition (roughly KEH bargain grade). Shutter speeds sound accurate, although I have not had the shutter tested. The meter works OK but may need some adjustment. The Super Takumar 50 is the relatively rare, early, 8-element version of the Super Tak 50/1.4, and is a bokeh champ. I do not see any scratches or fungus; there are a few small dust specks inside. 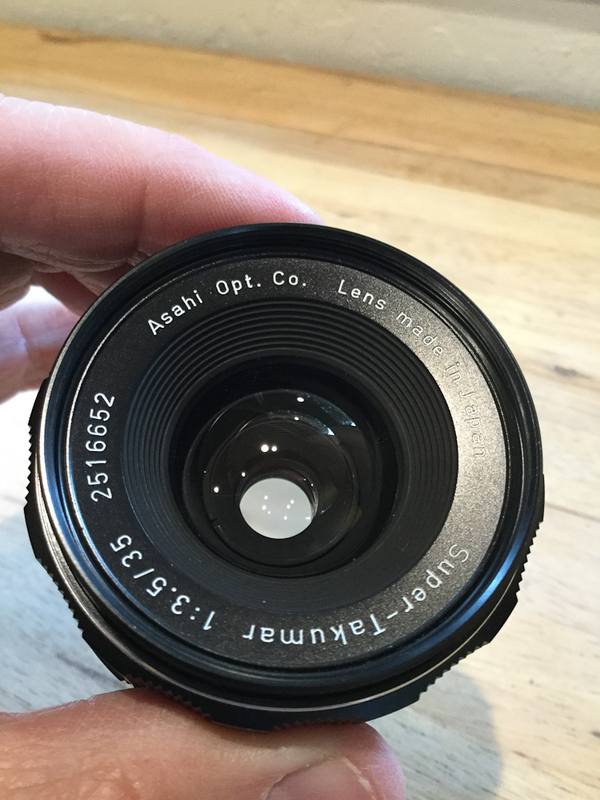 The lens comes with an Asahi Pentax skylight filter and a Pentax front lens cap. The is a great starter kit for SLR film photography, or for fans of Takumar lenses. Price for the set is $165.00 US (I will not sell the lens and camera separately). SOLD!! (3) Asahi Pentax-M SMC 100mm f2.8 in Pentax K mount. Glass is in excellent condition, with no scratches, fungus, or dust that I can see. A very compact moderate telephoto for portraits and landscapes. Comes with a B&W 49mm UV filter, and generic front and rear caps. Price for the lens is $85.00 US. 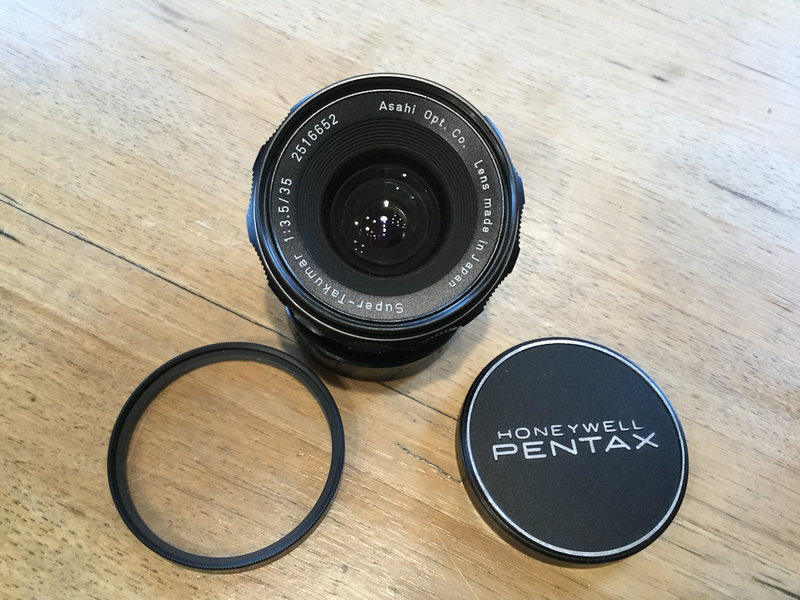 (4) Asahi Pentax Super-Takumar 35mm f3.5 lens in M42 (thread) mount. A nice companion for the Spotmatic! The glass has no scratches or fungus that I can see; there are a few small dust specks inside. It's sold with a new Hoya 49mm UV filter, a Takumar rear lens cap, and a Honeywell Pentax front cap. 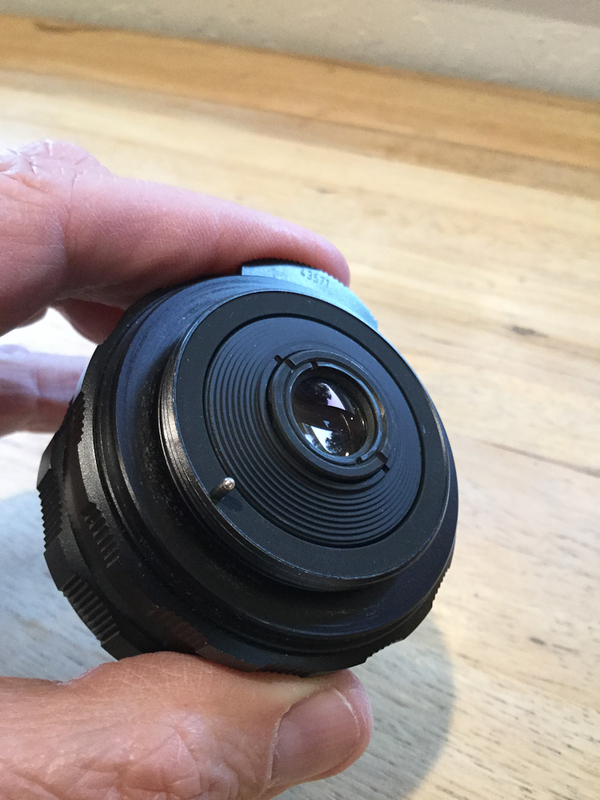 I will add pictures of this lens below. Price for the lens is $50.00 US. All prices include shipping within CONUS by USPS Priority. For shipping outside CONUS, add $10.00. The Spotmatic kit is sold. All times are GMT -8. The time now is 15:06.